Instead of making a grand piano, this time I choose an antique piano where I find it different from the other piano that I have done before. As requested by the owner to create a girl playing the piano, it was quite amazing that I have done it. 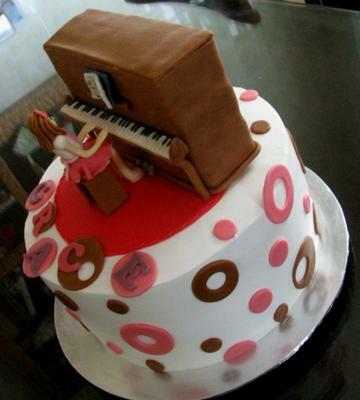 The piano is made of cake covered with fondant. The girl and the rest of the decorations are made of modeling fondant. The bottom cake is Chocolate Banana Cake. hi witch country are u in?? As this cake would be perfect for my birthday and that girl would probably be me I play a piano like that every day. Make for her birthday or anniversary just need to plan ahead of time. Happy baking. I have wanted to try one like this because my mom has a piano like that but I never seem to have the time anymore!